Today’s Nice Price or Crack Pipe BMW is appropriately both shark-nosed and manual-equipped. You’ll need to decide if all that makes its price the coupe de grâce. Volvo’s present lineup includes the XCs which are good for those rustic gravel driveways favored by artisanal wine makers and purveyors of yet to break out primitive folk art. If your interests lean more toward taking dirt roads balls to the wall, and then maybe a cold Abro, then your Volvo of choice would very well be yesterday’s 1973 142. That car took center stage - center rally stage that is - and an amazing 83% Nice Price win for its trouble. The Volvo we featured yesterday was a modded coupe with sporting pretensions from a venerated European brand that enjoys a generally enviable reputation for its earlier products but has perhaps in more recent times somewhat lost its way. Hmmm, interesting. The same thing could be said - verbatim - for today’s 1983 BMW 633CSI. Imagine that. BMW’s E24 is an interesting car. Not just because it’s generally considered to be a stately big coupe with adept handling and rakish good looks, but also because, over the course of its life - 1976 - 1989 - it was actually two pretty different cars underneath while keeping almost the exact same styling up top. What changed was the underpinnings, the ’76 though ’82 cars being based on the older E12 5-series platform, while the later cars rode on that of the more modern E28 sedan. Visually, the easiest way to tell the difference is by looking at the swage line atop the front wheel arch. On the early cars there’s several inches between arch and line, while the later cars they almost meet. This ’83 is an example of the latter, and, based on the ad, we’ll have to decide just how good an example it is. First off, the particulars. The car is a 633CSI so its engine is the M30B32 SOHC straight six with 181-bhp. The ad notes that the car has the desirable 5-speed manual, which will put those ponies to best use. A Rieger body kit, which looks to consist of rocker extensions and maybe all the black-out trim dresses up the body which otherwise looks straight and stock. The bumpers have been tucked in, both front and back, which makes them less onerous, but also less effective. BBS wheels off a later 3 or 5 series brighten things up a bit and are probably pretty dear on their own. On to the interior, which is in cardinal red and features front seats from... a Maserati? What the ever-loving huh? The seats show in the photos typical Italian low-production model durability what with their with splits and tears and whole sections of the leather missing in places. Ten points to the first person that can ID the Maser model from which these were pulled. I’m guessing some sort of Biturbo. Those thrones were most likely not included in the two-grand in new parts the ad touts have been appended to this car. Of course, it would be nice to know what that actually did include. Regardless, the price is now $2,800 OBO which of course means or best offer, but which I like to think of as oppressive body odor. 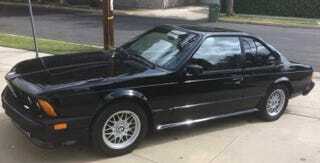 What’s your take on this E24 for $2,800? Does that seem like a killer deal for one of BMW’s most venerated models? Or, does that make you, like the original seats, out of here? Santa Barbara Craigslist, or go here if the ad disappears.